Recycling is a process of using a second hand product to create a new output that makes sense and a good use of it by using our creativity whereas art is a form of using our imagination and creativity to create an object with a hidden or direct message to the public or the viewers so they can question and make assumptions to their piece of artwork. In recent years, many artists have started expressing their desire for recycling and sustainability through artworks where they merge traditional tone with contemporary themes creating attractive installation art in the larger public interests. Artists are expressing their emotions and ideas through a wide range of recyclables such as metals, glass, beverage cans, plastics, CDs, PET bottles etc. Artists can collect recyclable materials through public donations, collaboration with businesses or direct collection from solid waste stream. Many artists search for inspirations that surround them while others express their feelings in the artwork. Artists use recycled or reused objects to make attractive pieces of contemporary art and literally turn everyday trash into creative treasures. Some create compositions from recycled plastic bags or themed works for art galleries, while others create entire theme parks with trash, and even furniture from recycled materials. For example, if an artist has a penchant for collecting beverage cans, he/she might be interested in creating a replica of a famous building or monument. This innovative approach not only creates environmental awareness but also help in finding a good use for unwanted materials. For example, giant bottles made of recycled plastic bottles are tipped over on the grass at an art installation in North Evanston, Illinois. Approximately 6,000 small, clear plastic bottles were used to construct the five 16-foot bottles on display. 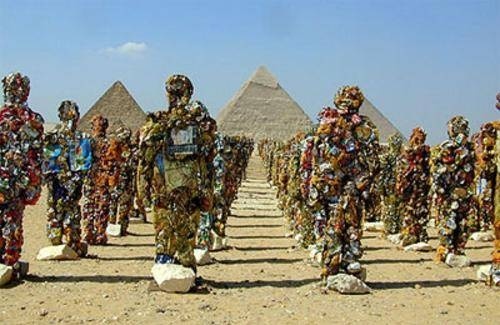 Around the world, eco-artists are turning recyclables into creative pieces of art and thereby contributing to the Green Movement taking place in different spheres of life. Artists are finding innovative ways to show their concern for the environment and thus encouraging the masses to reuse, reduce and recycle for a better future. With waste disposal posing a serious environmental challenge around the world, it is expected such initiatives will also spur governments to take concrete actions to ease the situation.